As I mentioned the other day there is still just about time to plant your onions, so with that in mind its the perfect time to talk onion. The onion,(allium cepa)almost certainly comes from the central Asian region. However as it has been in cultivation for so many years the exact origin is now unclear, in fact there are five possible wild plants it could have evolved from. It was the Romans who named and introduced the onion to Europe, the Latin name was ‘unio’ for large pearl, changed to ‘oignon’ by the French. The popularity eating onions rose significantly after French Onion Soup was popularised by Stanislaus I, the former King of Poland. It is recorded that during the Middle Ages people would pay their rent with onions and even give them as gifts as onions were such an important food. However moving on to the allotment, how do you plant onions? Onions come in several coloured varieties such as yellow, red, or white,. However the vast majority of onions grown are of the yellow varieties. This is because yellows are good all round onions and also keep better over winter when stored correctly. In addition the yellows have tougher skin and are more disease resistant being less susceptible to insects. Red onions are the sweetest but typically the worst to keep over winter. White onions are usually grown for salad or spring onions and are harvested as green onions before their bulbs fully form. Onions should be given a sunny aspect in a rich but also a light soil, however they will usually do pretty well in most soils. However in common with many other plants do not plant in freshly manured soil. Onions can be planted as sets (small, immature onions) in the spring or late summer, through to Autumn. Sets come in a variety of sizes and each forms one full sized bulb when ready to harvest. 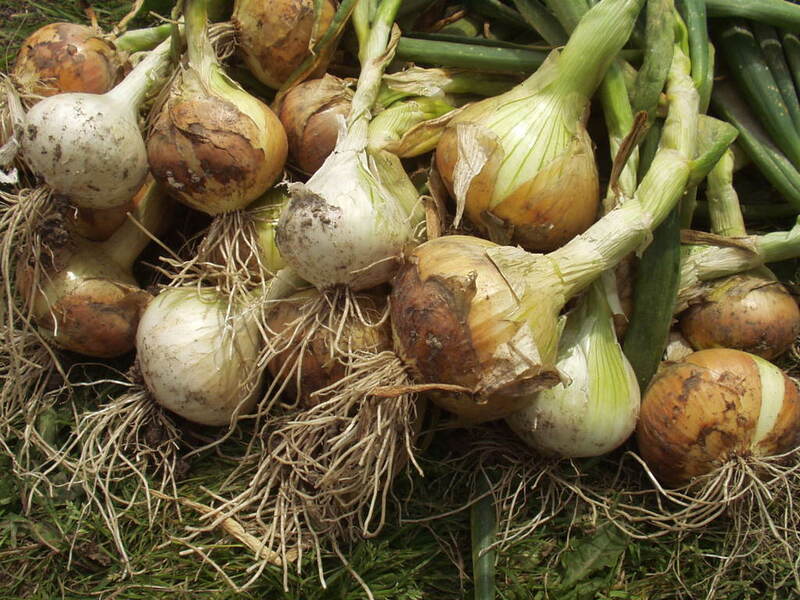 Growing onions from sets is usually much easier and will also be more reliable than from growing onions from seed. Not only are they more reliable but in cooler and damper areas then sets will give a better harvest of larger bulbs than if you just grow them from seed. However with sets there are fewer varieties available to select from and the cost will be higher than if you grow your onions from seed. To plant your sets space them about 4inches apart with 8 inches between the rows, with the pointed end upward sand with the tip just below soil level. A good method that I was taught on my grandfathers allotment is to plant your seed in the autumn in drills about half an inch deep with rows about 16inches apart. Leave until spring, when the seedlings should be thinned to 2inches apart. If leaving late in the season try planting in a greenhouse in trays & transplanting 2inches apart when hardened off. Although Onions are an easy crop to grow, there can be some problems, do watch out for these. The onions grow a central stalk that if left unchecked would develop the seed head. It is usually caused by weather conditions, typically if there is a cold spring followed by a hot summer that seems to encourage it. If the bulbs are not in firm ground then this can also cause bolting. To prevent it being a problem then cut the stalk off an inch or so above the bulb but remember to eat these onions first since they do not usually store as well. If you get a grey mould on the onions you have in store or general rotting then this is usually caused by the onions not having dried out enough prior to storing or even damp storage conditions. 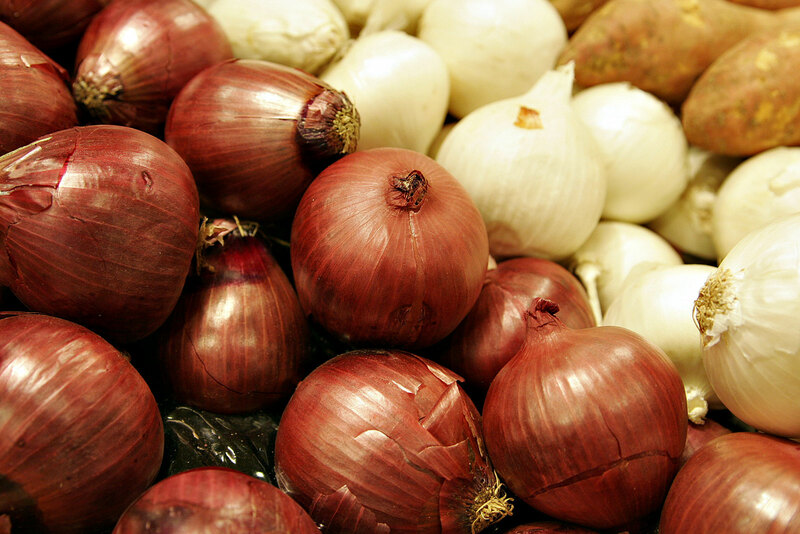 You should check regularly and remove any onions showing signs of rot before it spreads to the others. This can occur during prolonged rainy periods. Any bulbs showing signs of mould or rust must to be thrown away or ideally burnt. To reduce the risk then give your plants some protection with a cloche in wet periods, but allow ventilation. This causes the foliage of your onions to go yellow and to wilt. Look out for fluffy white growths to confirm that it is onion white rot. Any plants showing signs should be thrown away (do not compost) and then you must not grow garlic or onions in the same area for at least 8 years as the fungal spores can remain in the ground. Mildew will give the leaves an appearance of having slightly lighter patches in the early stages that will gradually turn to brown as the disease gets worse. To avoid this you should use crop rotation and ensure you have good drainage. These flies will lay their eggs by the base of the onion which when hatched turn into maggots that will eat the base of the onion as well as its roots. The only prevention is to prevent access using fleece as sadly there is not a cure once affected. Due to an increased level of spam, comments are being moderated. We have had to turn off anonymous users, sorry for any inconvenience caused. The Diligent Gardener is an online gardening magazine based in the UK for keen gardeners. Whether you’ve got a garden, allotment, or balcony, you’ll find all the gardening ideas and advice you need to create a beautiful and truly satisfying private space to relax and be at home in. As well as tips and ideas for your own garden we can share with you the best days out and competitions. Composite decking, not just for your home. CHRONIC DISEASE DOES NOT HAVE TO DEFINE YOU. “There are no onions” exclaimed the chef “we must use deck quoits”. All content Copyright © The Diligent gardener 2011-13. Travel theme. Powered by Blogger.